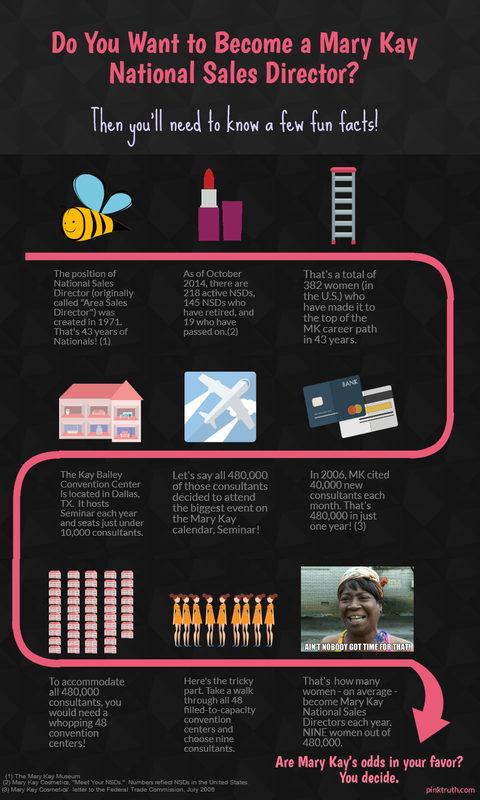 Check out the graphics below for the fun facts about how likely you are to become a National Sales Director in Mary Kay Cosmetics. New Mary Kay NSD Rules? Unless you are a narcissist and don’t care about hurting others, becoming an NSD isn’t worth it. Unlike a real business where you are a CEO and those below you get real pay checks, in MK hundreds of women will not make a regular pay check. Only the original 145 NSD’s made it before this pyramid house of cards inevitably began collapsing. Not worth it. Initially all those NSD stories sounded too good to be true and they were. I suspected there was a catch. The catch was hurting other women. I joined MK to help others not to take their grocery money. Also the loss of time with family and hurting family financially while trying to make this mlm work. It no longer works because today’s women soon realize they are being misled. They read it on the web and hear it from others. The thing that just stuns the senses, is how can they KEEP doing it? How can they keep saying the same things, making the same speeches, hiding the same facts, marketing the same deceptions, watching the same crash and burn scenario’s of their downlines, and justifying all the nonsense leading up to same. Who ARE you, Ms. National Sales Director? What kind of predator promises one thing and delivers exactly the opposite? And for Directors who are working holding facials and classes and doing interviews and meetings, and guest events and consultant training and Debuts, and supporting offspring,…how’s that never ending hamster wheel feel about now? Ya getting anywhere? Really?? Getting comfy with attrition, are ya? I suggest you look at your financials and compare them to ten years ago. Can you afford another ten years? Think your NSD will loan you some money to clear the debt? The hamster well! Yes!! That’s exactly what it felt like. Same thing after every Leadership. Then the slump of February. Then a boost with Spring products. Then getting creative and desperate to have better Arena seats at Seminar. Then complete shutdown in July. I was just realizing this weekend how SO much happier I am to be home with my family while they’re wearing fake boas and strutting around New Orleans like they’re wealthy, successful, and fulfilled. And not 1 work commitment for any weekend or weeknight to come on the horizon! The idea of being at one more Leadership, with yes, the “outfit” that was for Motivational night…aghhhh…gag. Contrived camaraderie! Look how we out do every other area! -YES! So happy to be home, with my family. 480,000 consultants in one year. We know of course that just as many have quit, but who would join knowing there is that much competition? That would be like opening 10 McDonalds outlets in a small town of 1000 people. I started doing MK with absolutely no intention of moving up the ladder and recruiting, I just wanted to make extra money and get a discount on the products. I have since come to realize that is not going to happen because MK is a scam. My recruiter told me last night that I need to start going to weekly “success events” because “those who show up go up” and no director ever misses an event. I almost told her that I have zero desire to be a director and be on the never ending hamster wheel, but I bit my tongue instead. I worry for her because she’s a nice person (at least while I’m in MK), and she has two boys and a husband to support and she wants to quit her teaching job to be a MK director and eventually NSD. She’s very deep into the fog. I recently saw one of my Directors and realized she is in the same place she was years ago when I resigned. Same car. Same or less income. I overheard her conversation to another person where she opened up about how stressed out she is and how she is doing everything she’s told to move up but can’t. She said she’s not sleeping and is having unhappiness at home now. Take your gut instinct as a warning and don’t fall prey to giving up your nights and weekends like I did. As for your friend, we can’t save them all. We can only make wise decisions ourselves and show them how happy we are outside of MK.